... AND ensure you dont break the law! 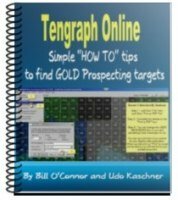 ...AND You will be using the powerful tengraph online system in minutes without investing a cent! It's Free. Provides an EASY means of determining LAND AVAILABLE for mineral exploration or Metal Detecting. It gives a CURRENT and ACCURATE picture of land under mining lease activity. It also provides information from other databases such as Mineral Titles Online, WAMEX (Mining Tenement open file exploration reports) and MINEDEX (Mine site and Mineral Deposit information. It is also LIVE and UP TO DATE - Not like the tenement map you got printed out last year at Mt Magnet!! Firstly you wont break the law prospecting on land where it is not allowed. You will find out where current gold prospecting (and other prospecting) activity is going on. You will be able to research Exploration Tenements and print out graticule sheets for Section 20a applications. You will be able to obtain historical information about old gold mines, abandoned gold mines, gold fields and old mining towns. You will be able to get exact GPS points for your target areas and tenements and use them with your GPS equipment and software with moving maps. You will be able to print out high quality PDF Maps of your target gold prospecting areas. You can link pending or approved tenements to Google Earth in your target gold prospecting area and print them out to take with you to the field. You won't have to rely on the Department of Mines and Petroleum hours of business because Computer systems never sleep. Did I mention - You wont break the law prospecting on land where it is not allowed. These incredible Advantages of using this software far outweigh the small investment in time you need to learn how to use it. Upgrades To these EBooks are Free Sign up for the egold newsletter which Udo and I will send out monthly. This newsletter will also advise you if there have been any changes or upgrades to the Free EBooks. This is important because the Website Links to the Department of Mines do change. PLEASE NOTE: The Tengraph System will be changing to a new system called Tengraph WEB sometime in the future by Department of Mines Infrastructure, Resources and Safety (DMIRS). Currently Tengraph WEB is in operation and the two systems will run in parallel for some time so make sure you get to know how to use the current Tengraph Online system. Once you do experience the benefits of using the online Tengraph Web compared to Tengraph Online We feel sure that you will use that system over Tengraph Online. You will need a PDF reader to read the Ebook, if you cannot open it the downloaded PDF file then you can download Adobe Reader by left clicking on the icon below. 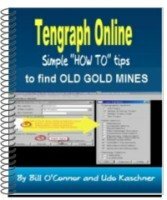 NEW Free Ebook "How to Find OLD GOLD MINES Using Tengraph Online"
Click Here for your Free, Graphical "How To" EBook on Finding OLD GOLD MINES. If you have any problems with the download or any questions about Tengraph Online please Contact Us, we are happy to help you find gold.